Litak, R. K., Barazangi, M., Beauchamp, W., Seber, D., Brew, G., Sawaf, T., and Al-Youssef, W.
A lack of dramatic surface geologic structures along the Euphrates River in Syria belie a complex tectonic history revealed by newly-released seismic reflection and well data. We document the intraplate Euphrates fault system, characterize the variation in structural style along its 350 km length in Syria, and infer its Mesozoic-Cenozoic tectonic and deformational history. We then relate the deformation of the Euphrates system and other proximate intraplate structures to nearby Arabian plate boundary processes in order to develop a new model for the kinematic evolution of the northern Arabian plate. Throughout most of Mesozoic time, the Euphrates area experienced minor deposition compared to the Palmyride trough to its southwest, and the Sinjar trough to its northeast. During latest Cretaceous time, however, significant sinistral transtension occurred along the length of the Euphrates fault system in Syria, with graben formation especially noteworthy in southeastern Syria. This episode was probably related to events at nearby plate boundaries, and may have reactivated a zone of weakness formed during Pan-African accretion of the Arabian plate. A Paleogene sag basin formed over the graben system in southeastern Syria. 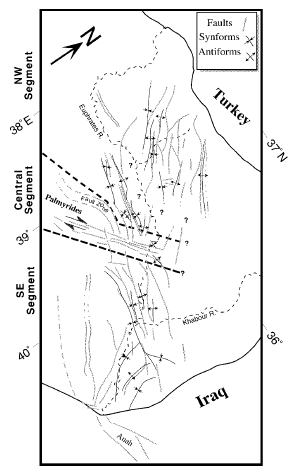 Neogene continental collision along the northern and eastern Arabian plate boundaries precipitated minor reactivation of the Euphrates fault system in a dextral transpressional sense, in concert with significant inversion and the main phase of uplift of the nearby Palmyride and Sinjar mountains. This material has been published in Journal of the Geological Society, London, 154, 653-666, 1997, the only definitive repository of the content that has been certified and accepted after peer review. Copyright and all rights therein are retained by The Geological Society of London. Figure 4. Structural framework of the Euphrates fault system interpreted from seismic reflection and well data. The southeastern and northwestern segments are distinguished from the central segment, which is dominated by interaction with the Palmyride mountain belt. Many faults have experienced a combination of normal, strike-slip, and reverse movement, as discussed in text, hence oVsets are not shown. Gray dashed lines denote inferred faults. Heavy dashed lines separate the three sections of the Euphrates fault system. Question marks denote areas of limited or no data. See Fig. 3 for database. Figure 15. (a) Generalized isopach map and proposed tectonic scenario of the northern Arabian platform, focussed on Syria, during most of Triassic through Turonian time. Sediment thicknesses based primarily on extensive well data in Syria and Jordan, and (for the Anah area) personal communication from M. W. Ibrahim. 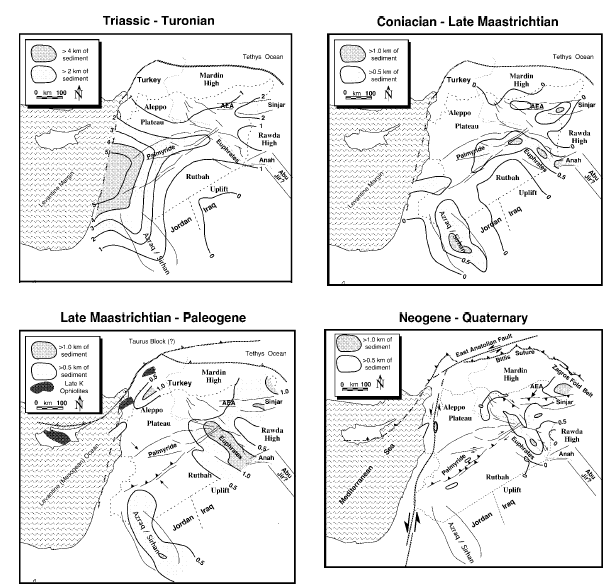 Major deposition occurred along the Levantine margin and in the Palmyride and Sinjar troughs. In this and subsequent figures, present-day geography has been retained for reference. AEA: Abd El Aziz. Contour interval 1 km. (b) During Coniacian to Late Maastrichtian time, diminishing subsidence along the Levantine margin and southwestern Palmyrides gave way to increased deposition in the interior areas of the northern Arabian plate. Major deposition occurred in the Sinjar, southern Euphrates, Bishri, and Azraq/Sirhan areas. Contours represent generalized isopach map of ConiacianLate Maastrichtian rocks; contour interval 0.5 km. AEA: Abd El Aziz. (c) Proposed general tectonic scenario during Late Maastrichtian to Paleogene. Collision along the northwestern margin of the Arabian plate emplaced ophiolites and led to initial inversion of the southwestern Palmyrides, and cessation of active rifting in the Euphrates graben system. Contours represent generalized Paleogene isopach; contour interval 0.5 km. (d) Proposed general tectonic scenario during Neogene. Continental collision along the northern margin of the Arabian plate is accommodated by dextral transpression in the Palmyrides (and, to a lesser extent, in the Euphrates), compression in the Sinjar/Abd El Aziz area, and minor compression in the Anah area. Contours represent generalized isopach map of NeogeneQuaternary sediments; widespread deposition in eastern Syria probably represents northwestern terminus of the Mesopotamian foredeep. Contour interval 0.5 km.